(Las Vegas, Nevada) Nevada Broadcasters Association President Mitch Fox announced today that Nevada Congressman Mark Amodei will be honored with the prestigious President’s Award, during the Association’s Annual Hall of Fame Gala on Saturday, August 24, 2019 at 7pm at The Four Seasons Las Vegas. 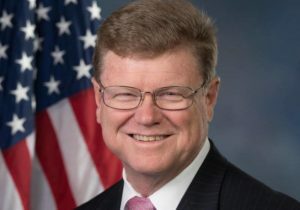 Congressman Amodei understands the importance of local radio and television, which provide free news and information, children’s programming, Emergency and Amber Alerts and public service announcements highlighting Nevada’s non-profits. The Nevada Congressman was first elected to the Nevada Assembly in 1996, representing Carson City. In 1998 he ran for the State Senate and served three terms. In 2011 Amodei was elected to Nevada’s Second Congressional District. He has served on the House Judiciary, Natural Resources and Veterans Affairs Committees and currently serves on the House Appropriations Committee and two of its subcommittees. This year marks the 24th Nevada Broadcasters Association Hall of Fame Gala and will take place on Saturday, August 24, 2019 at The Four Seasons Las Vegas. All money raised at the Hall of Fame Silent and Live Auctions benefit the Nevada Broadcasters Foundation’s Tony and Linda Bonnici Broadcasting Scholarship Fund, which provides tuition scholarships to students attending Nevada’s Colleges and Universities. To purchase a sponsorship, reserve a table or place an ad in the program, please call (702) 794-4994. The mission of the NVBA is to promote and advocate for the Broadcasters of Nevada while serving the public. We help improve and preserve, on a national and statewide basis, an economic, legal and regulatory environment that best enhances the ability of each Station to be financially strong, to remain free from governmental control of programming, and to excel in the public service roles that each Station plays in Nevada. The NVBA offers a robust Public Education Partnership program providing government agencies and non-profits, the ultimate in public outreach and awareness. We seek to educate Nevada’s local, state and federal officials along with other community leaders about important broadcasting issues, concerns and challenges, in an effort to create increasingly strong and healthy communities. The Nevada Broadcasters Foundation (NVBF) and the Tony & Linda Bonnici Scholarship Fund finds the very best broadcasting and journalism students in Nevada and empowers them to pursue their dream by awarding scholarships. The Foundation awards full tuition scholarships to the next generation of Nevada’s broadcasters. This scholarship is unique in that it is a scholarship by broadcasters for broadcasters. For more information about NVBA and NVBF, please call 702-794-4994, or visit http://nevadabroadcasters.org.